Rosh Hashanah is a time of newness. New beginnings. New hope. And new chances to pursue our dreams. The foods of Rosh Hashanah help pave the way by symbolizing all the good things to come. 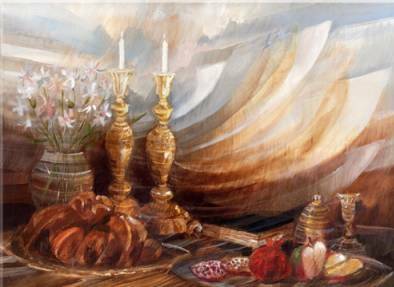 Below is a list of a few traditional Rosh Hashanah foods, their meanings, and new ways to incorporate them into your New Year celebration. On Rosh Hashanah, the Challah is round instead of the typical braided oval loaf. The roundness is thought to characterize a crown, reminding us that Rosh Hashanah is the “head of the year.” The shape is also symbolic of the perfect year to come. Some people place a little bird or ladder on top of the Challah to symbolize the wish for our prayers to reach heaven. A creative idea is to make them out of sugar cookie dough––a great project for kids as well! Sweetness, which symbolizes our hopes for the new year, is represented by many traditional Rosh Hashanah foods. Perhaps the most well known is the custom of dipping apples into honey at the start of the Rosh Hashanah meal. For a modern spin on this tradition, consider setting out different varieties of apples and honey for your guests to try. Our article, A Taste of Things to Come, tells you how (see below). Another sweet favorite on Rosh Hashanah is Noodle Kugel. For a new twist on this classic, try Susie Fishbein’s recipe for Individual Peach Noodle Kugel. Everyone likes a good sweet noodle kugel at Rosh Hashanah time. Serving it in individual portions makes for an elegant presentation and helps with portion control for the dieters at the table. I like using parchment paper cups or ramekins. Preheat oven to 350 degrees F. Fill a large pot 3/4ths of the way with water. Add 1 tablespoon of salt. When the water is boiling add the noodles and cook, as per directions on the package until al dente. If using ramekins, spray each one with non-stick cooking spray. While the noodles cook, crack the eggs into a medium mixing bowl. Add the sugar and the juices from the cans of pineapple and peaches. With an electric mixer, beat until combined and foamy. Add the pineapple chunks, diced peaches, and cranberries. Stir with a wooden spoon or silicone spatula. When the noodles are done, drain them and return them to the pot. Add the margarine and allow the heat from the noodles to melt the margarine, stir to combine. Pour the egg mixture into the pot and toss to combine. Ladle the noodle mixture into the ramekins or parchment cups. Place them on a parchment lined baking sheet. In a small bowl mix the cinnamon with 2 tablespoons sugar. Sprinkle evenly over the top of each kugel. Bake, uncovered, for 35 minutes. If you don't like a crunchy top, bake the kugels covered. Eating a fruit that we have not yet eaten in the past year is suggestive of the newness of the year. It’s also a way to express our appreciation for the many fruits of the earth. A delightful way to incorporate this custom into your Rosh Hashanah table décor is to place a different kind of exotic fruit at each place setting––either in a small bowl or on the napkin at the center of each plate. Fish, as a symbol of fertility (among other things), is also a featured food on Rosh Hashanah. Serving Gefilte fish is a modern way to honor this tradition. With so many varieties available, Gefilte fish lends itself nicely to a tasting station if you are having a buffet Rosh Hashanah dinner. Or, try putting small slices of several types of Gefilte out on a tray with crackers as hors d'oeuvres before a sit down dinner. Both are savory ways to start the new year with a sampling of something new. 1. If you do not have a large surface in your home that you can use to put out food, such as a dining room table, set up several smaller serving stations: one for appetizers, one for main course selections, one for side dishes, and so on. 2. Place selections in the order in which people will be eating them. For Rosh Hashanah, for example, an apple, honey and Challah serving station should be among the first as they are typically the first foods eaten. 3. Put napkins and silverware after the last serving station (not next to the dinner plates in front of the first serving station). This way, guests don’t have to juggle their napkin and silverware throughout the buffet. 4. Put a small plate in front of each selection to hold its serving utensil. 5. Label what each selection is for your guest using a small card, such as a place card. If you’re having guests over that are unfamiliar with Rosh Hashanah traditions, you may also want to include a short explanation of key dishes. For example: “Apples and honey for a sweet new year.” It’s also nice to keep place cards on hand to label dishes that guests bring, such as “Aunt Sarah’s Kasha with Bow Ties” (see recipe below). 6. For main course selections, serve dishes that include sauce to prevent them from drying out over time. 7. In addition to wine, be sure to give your guests non-alcoholic options. A festive selection for your drink station is Grape Juice Spritzers (see recipe below). Either pre-pour in glasses or write up simple instructions (a la the place cards) for your guests to make themselves. 8. Decorate the buffet table with small vases of flowers, apples, shofars, or other symbols of the season (think of each serving station as a small vignette). 9. Avoid using candles in your buffet décor as they can be unsafe around all the hustle and bustle your delicious buffet is sure to attract. In 10-inch skillet over medium heat, melt one tablespoon of margarine. Cook mushrooms and onion until tender. In a small bowl beat egg whites slightly, add kasha and stir until grains are well coated. Push vegetables to one side of skillet. Add the remaining margarine. Cook kasha for 2 minutes until grains become separated and dry. Stir constantly. Stir in boiling water, salt and bullion cube. Bring to a boil over high heat. Reduce heat to low, cover and simmer for 10-12 minutes until kasha is tender. Cook Manischewitz® Egg or Yolk Free Bow Ties according to package directions. Drain pasta and add to skillet. Mix bow ties with kasha and vegetables. Fill champagne flutes halfway with seltzer. Fill the rest of the way with Manischewitz® Concord Grape Juice or White Grape Juice. 1. Have the tasting before dinner, as an appetizer or hors d'oeuvres course (to keep the dinner table uncluttered and so the first food that’s eaten on the new year can be something sweet). 2. Serve the tasting at your coffee table, kitchen counter, or any other area where your guests will be gathering prior to dinner. 3. Cut up several varieties of apples, arrange them in small bowls, and place them in your tasting area (to keep apple slices from turning brown, sprinkle them with a little lemon juice). Indicate the apple variety on a small card next to each bowl. 4. Set out several types of honey in your tasting area (Manischewitz offers 4 varieties: Orange Blossom Honey, Wild Flower Honey, Golden Honey, and Clover Honey). 5. Keep the honeys in their jars so guests can read the varieties on the labels. Place a small spoon in each jar to help dip the apple slices. Put an attractive, washable coaster under each jar to catch any drips. 6. As an alternative to the honey jars, make apple serving bowls: cut off the top of apples, carefully scoop out their insides with a melon scoop, and fill with honey (don’t forget to indicate the type of honey on a small card next to each bowl). 7. Include a loaf of Challah with a knife and cutting board in your tasting area as guest will surely want to dip Challah into the delightfully sweet honeys too. 2. Challah (or ingredients to make own, such as yeast, sugar, eggs, vegetable oil, salt, flour).